(Photo: ENS / Mary Frances Schjonberg)Episcopal Diocese of Washington Bishop Mariann Edgar Budde recites prayers at the first Way of the Cross station March 25 in Lafayette Square in Washington, D.C. Diocese of Connecticut Bishop Suffragan James Curry, left, and Connecticut Bishop Ian Douglas listen at their march against violence. U.S. Sen. Rand Paul (R-Ky.) is threatening to filibuster another high profile bill next month, when Democratic gun control legislation comes up for debate. Paul, who received national attention this month for a 13-hour filibuster on the nomination of John Brennan for director of the Central Intelligence Agency, sent a letter Tuesday to Senate leadership promising more to come. Signing the official document with Sens. Ted Cruz (R-Texas) and Mike Lee (R-Utah), Paul promises Senate Majority Leader Harry Reid (D-Nev.) a sustained filibuster with the intention of derailing the legislation. "We, the undersigned, intend to oppose any legislation that would infringe on the American people's constitutional right to bear arms, or on their ability to exercise this right without being subjected to government surveillance," the three wrote in the letter. "We will oppose the motion to proceed to any legislation that will serve as a vehicle for any additional gun restrictions." Earlier this month, Paul conjured up images of Mr. Smith Goes to Washington (1939) when he stood on the Senate floor for 13 hours to deliver a filibuster against Brennan, so as to raise awareness of the Obama administration's drone policy. That filibuster was intended to increase criticism on a military weapons program that Paul is ideologically opposed to. However, this implied filibuster would be performed by the more modern standards. Launching a silent filibuster, the three Tea Party favorites aim to block any debate or amendments being added to the bill. This would be achieved by filing a filibuster against the motion to proceed. The proposed legislation includes universal background checks being required on all gun transfers. The proposed policy is one of the key positions advocated by the ecumenical group, Faith United Against Gun Violence. Also, there is a strong likelihood that caps on ammunition rounds and assault weapons bans will be proposed for bill amendments. While such amendments are unlikely to survive a vote, they are also positions supported by ecumenical groups. Unless Reid can get a super majority of senators to agree to motion for debate, he will need unanimous consent on the bill, which Paul and his colleagues are promising to not allow. A spokesman for the Senate majority leader has since condemned the letter, but no political counter has yet been announced. 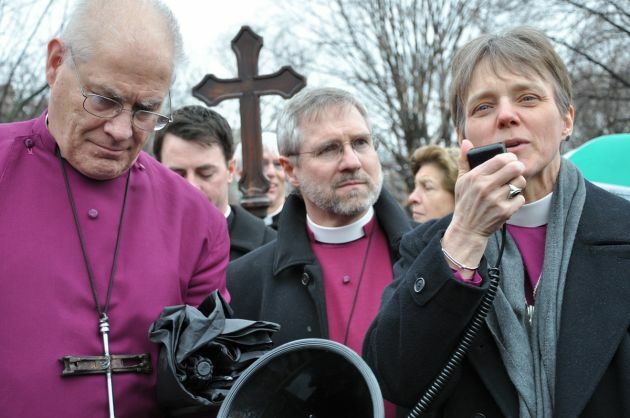 Episcopal clergy and laity gathered March 25 for a Holy Week Way of the Cross procession in Washington, D.C. in the latest in a host of church activities aimed at highlighting and combating gun violence. Across the United States, Episcopalians have lobbied legislators to support gun-control laws, visited gun venders, hosted gun buybacks, created artwork memorializing gun-violence victims, preached about gun violence and observed a Gun Violence Prevention Sabbath. The current emphasis on reducing gun violence stems from the Dec. 14 fatal shooting of 20 pupils and six educators at Sandy Hook Elementary School in Newtown, Connecticut.